Diners' interest in getting food delivered to their doorstep is on the rise, and restaurant chains and tech firms alike are taking note. Food delivery could spark a new arena of competition in the restaurant industry and shake up emerging technology as a dreaded disruptor -- Amazon -- enters the fray. According to a Morgan Stanley research report, some $210 billion of restaurant food is eaten off-premise each year. Only $11 billion of that is delivered after being ordered online, so there is a huge runway for growth as more and more people order online. Restaurants' own apps are an easy way to order food while GrubHub is the leading online food-ordering company, counting 55,000 takeout restaurants on its rolls. Estimates put growth in digital food delivery at about 15% a year, helping put the roughly $30 billion delivery industry at over $50 billion in less than five years. The sudden surge in interest is being driven by the intersection of two trends: Delivery is getting cheaper and Americans are eating more food made by others. Pizza is the main delivery food in America, but the falling cost of delivery being driven in large part by technology services like GrubHub is letting people get more fare the easy way. The app partners with restaurants so diners can conveniently look through menus, order, pay, and schedule a location for delivery. The price for that service has been trending toward $5 an order, apparently a sweet spot for consumers. The second trend helping delivery is the increasing importance of prepared food to the American lifestyle. 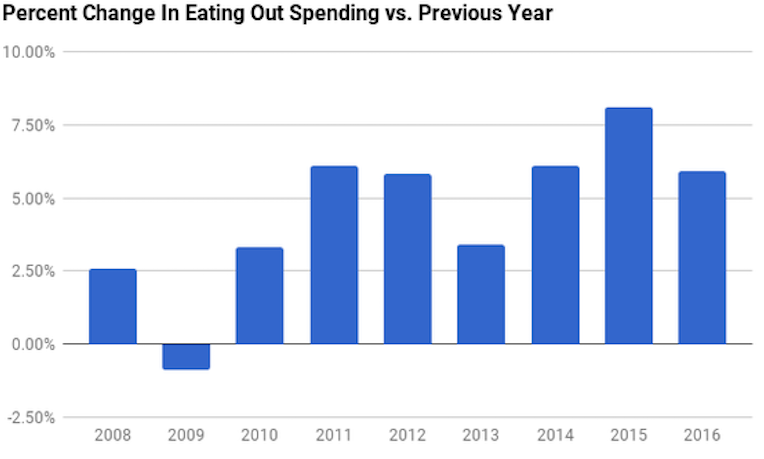 Since 2009, eating out spending has been growing by well over 3% per year. Total food budget spent on eating out is nearing 50%, up from about 25% in 1970. That trend implies that saving time is important for the average diner. If that's the goal in buying a meal, what better way to save time than to order online and have it show up wherever you are? The trend also implies that while the restaurant industry will keep growing overall, online delivery will represent an increasingly larger slice of the pie. These are statistics that Amazon must have noticed as well. 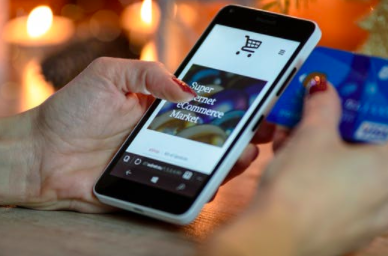 The digital retailer now offers a GrubHub-style service that promises restaurant delivery in under an hour to Amazon Prime members in select major cities. If ordering for delivery within Seattle, for instance, food choices range from sushi to Mediterranean to fine dining -- and it's delivered for free if the order exceeds $35, or for $4.99 for orders less than that. Amazon apparently intends to put pressure on GrubHub and similar digital delivery services, but a wider swath of the food industry could also be a target. Amazon is in the process of buying organic grocery chain Whole Foods, which it could leverage with its Amazon Fresh grocery delivery service, and that could make life difficult for meal kit delivery companies like Blue Apron. Whole Foods itself also owns a number of full-service and quick-service restaurants, giving an entry into another food area for Amazon to disrupt. As with all disruption, there will be winners and losers as various competitors vie for control. Look for restaurants that are well along in developing delivery or catering businesses to stay ahead of the curve. And look for any moves by Amazon to ripple throughout the industry. As for digital delivery companies, there should be plenty of business to go around even with Amazon potentially throwing its weight around. However, the entry of the tech giant into the space poses risks for companies like GrubHub and Blue Apron.